For years, PC gamers have needed to pick a poison: Buy a desktop with the most powerful components available, or sacrifice some performance for a laptop they could take on the road. Intel’s new 6-core mobile Core i9 chip, its fastest notebook CPU ever, paves the way for 5GHz gaming laptops, making that decision a little easier. Using new “thermal velocity boost” technology to propel the new Core i9-8950HK from a base clock rate of 2.9GHz to a whopping 4.8GHz, the new unlocked 8th-generation Core i9 sits atop five new Core i5 and Core i7 high-performance mobile H-series chips, plus four more U-series Core chips aimed at lower-power systems. (All are “Coffee Lake” 14nm chips.) Intel also launched a new lineup of desktop Core processors, plus a new designation (Core i7+) to indicate the presence of hard drive-boosting Optane memory inside notebook PCs. Compared to a 7th-generation Core processor, Intel says Core i9 is up to 41 percent faster in gaming frame rates and 32 percent faster when streaming and recording your gameplay. Since the new Core i9 is unlocked, expect gaming PC makers to release 5GHz systems, Intel executives said. And if Optane memory comes bundled, performance could increase further, though the 7th-gen system Intel used for comparison includes a slower mechanical hard drive rather than an SSD. In the top row, Intel compared the current Core i9-8950HK with the Core i7-7820HK for its gen-over-gen metrics. On the bottom row, the Core i7-8750H is being compared to the Core i7-4720HQ. Intel used Total War: Warhammer II and PUBG for “game FPS” and the gameplay/recording/streaming benchmarks, respectively. The new mobile Core chips support the software mitigations—not the upcoming hardware redesign—that Intel patched in to fix the Spectre and Meltdown vulnerabilities. The performance numbers reflect the impact of the mitigations, executives said. What this means for you: As with every mobile processor Intel releases, the real question is price. Intel doesn’t usually publish the prices of its mobile chips, and hasn’t in this case. With just a single Core i9 chip in the lineup, though, you should probably expect this to be shipped into the upper echelons of gaming laptops. The other chips we’re about to discuss are likely to reach many more people. Intel executives were blunt: PC gaming is exploding, and Intel’s chasing that market. Retail gaming notebooks with Intel Core chips inside them grew 45 percent year over year, Hamberger said. Intel’s new 45W H-series parts feature two new Core i7 and Core i5 chips, each, as well as a pair of new Xeons. In fact, the mobile Core i9 chip looks quite a bit like the Xeon E-2186, with identical clock speeds, core counts, thermal design power, and so on. The key, though, is that the Core i9’s clock speeds are totally unlocked. But if that’s too rich for your blood, consider the new Core i7-8850H, which also packs six cores and 12 threads. All of the new chips also support Intel’s new effort to push Optane memory into notebooks, with optional vPro technology for corporate systems. Intel’s Core i9 may be its new flagship mobile processor, but you’ll probably buy a Core i7-H-based machine, assuming that they’re more moderately priced. They have six cores too. While Intel’s Radeon RX Vega (“Kaby Lake-G”) chip was designed to offer 1080p performance inside of something that approaches an ultrabook, the new 8th-gen Core i9 chips are designed for what Hamberger called “musclebooks,” offering the absolute best performance that you can get on a laptop. “If this doesn’t get you excited, I don’t know what will,” Hamberger said. This is the first time that Intel has designed a chip with what it’s calling a “thermal velocity boost,” the ability to push the clock speed even higher than normal. Normally, the Core i9-8950HK maxes out at 4.6GHz after the turbo boost kicks in. But if the chip is “really cool and running at full speed, you’ll get a little more,” Hamberger said, boosting a single core by 200MHz, to 4.8GHz, or alternatively upclocking all of the cores by about 100MHz, he said. Hamberger reiterated, though, that the thermal velocity boost was an “opportunistic thing, not an automatic thing,” and that Intel had targeted system temperatures of 50 degrees centigrade or below before the boost would kick in. If you’re looking for something with a little less performance and a little more battery life, Intel also introduced four new U-series chips. These low-power (28W TDP) 8th-gen Core chips all feature the more common 4-core, 8-thread configuration. Note that these, too, support Optane memory technology in the mobile configuration. Intel’s 8th-gen, U-series chips offer more of a balance between performance and battery life. All of these will connect to the four new 300-series chipsets that Intel also introduced: H370, H310, Q370, and B360. All of them add more features from a platform level, an Intel spokeswoman said: enhanced audio and I/O, integrated Intel 802.11ac Wi-Fi with gigabit throughput, and 10 Gbit/s integrated Gen2 USB 3.1 I/O. 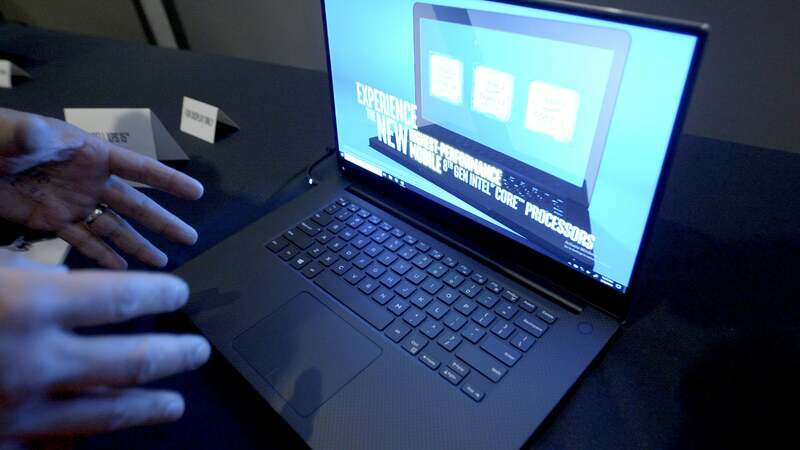 As sales of gaming notebooks have “absolutely exploded,” with retailers devoting more and more shelf space as the market continues to grow, Intel intends to continue to invest in this space, executives said. By boosting core counts and pushing to break the 5GHz barrier in gaming laptops, Intel’s certainly pushing the performance envelope.